Finished. It’s finished. Nearly finished. It must be nearly finished. Hopefully, you’ve found one or two new songs or artists that you hadn’t heard before, or rediscovered some forgotten gems, and that we’ve done our bit. Our time is up now, kids. These 12 months — and the shedload of songs, stories and elevenses they have brought — have been a lot of fun, but it’s time to move on. A year seemed about right, and there are lots of excellent new ways of discovering music that have popped up since we started (a favourite of which is This Is My Jam, say hello & hai! ), and perhaps our purpose is served. The other side of that, is that it got a bit tiring. I have endless respect and admiration for the people behind the 365, curating a person to contribute every day, needs full-time editors. Marie and I jumped in head-first without really thinking it through. I’m glad that we did it, after calling her on a flippant comment, but harrying people every week — with occasional anxiety about missing our set publication time — came to be a bit of a drag. When people are dead into it, they are dead into it; when they’re a bit lackadaisical, it’s a bit frustrating. Of all the weeks, we only missed one day (cheers, Brandon) and had a couple of late shows. Not bad, I think. Anyway, so the ending of it. We’d got tired early December, but decided we would stick with it until there was a natural moment to break it up. A whole year, 52-weeks, seemed as arbitrary as it did good, so we decided that mid-February would see the end of Playlist Club. It seemed so final. 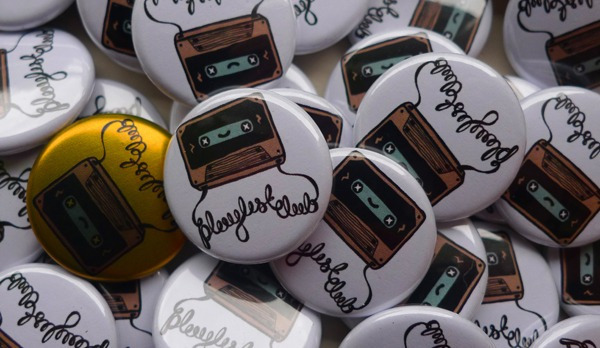 We’ve got a real URL, a proper logo (thanks Kipi), shiny badges (shout if you want one) and a massive stack of people who still wanted to contribute (sorry, pals). We’ve put in many hours to this thing, often with minimal reward, but it was a fun thing. Importantly, it was a thing, but its life had run and we put it to bed. I thought that maybe we could just tweak it, make it a monthly thing and lighten the burden on us, but it would just slowly diminish and lose any lustre that it had. This way, it may be a bit disappointing to a few people now — but we’re not disappointing everyone for a long time. It was good to do. I’ve been thinking about endings, off and on, for a while now. There seems to be a disjunct between ending Real things and Digital things, even if they’re not that different. In the ‘real world’, it is easy to put things to an end. Artists end their own stylistic periods, musicians kill off personae/bands (“Mount Eerie is a new project. The Microphones was completed, or at least at a good stopping point. I did it because I am ready for new things. I am new.“), narratives are drawn to a close (Gold Blend couple) and we all sup the last of the tea. I’ve noticed an odd trend of the concept of time in Digital. In ‘the past’, time has been planned, forward. Things plotted against and things made to arrive on a certain date, for a certain reason. An ad campaign would have its lifespan for as long as it could afford screenspace, newspaper ads, or billboards, or backs of buses. The product was locked into time and – because of that – had to end. Digital has given the illusion that time is some how more real now. Things are always on and always available, Day V Lately from the Yellow Pages campaign could be, right now, looking for his record in Vinyl Tap — so he will tell you about it, right now. But what happens when he definitely is not? It might be a bit facile to pick two fictional characters from ad campaigns, but they’re indicative of the difficulty in letting go. There’s the illusion that they could always come back, but there’s a slight hint of desperation — if what we’ve got lined up doesn’t work out, we’ll be back. There’s no desire to sever the ties, but I think that’s important for getting on with new things. At the bottom of the road, there is a shopspace that keeps changing hands into faddy niche shops. Most recently it was a pop-up shop selling antique French furniture, a venture that lasted marginally longer than the Garra Rufa fish pedicurist that had recently vacated the space. Before that, a variety of hairdressers turned over. It’s recently been occupied by a long-running bookshop not 100-yards away, Books On The Park. I’d been to Books On The Park before, it was supremely cramped and a bit surly. Still, indie bookshops are a dying breed and must be supported, so we went into the new space. Beyond all the pristine folios — a superb cloth covered collection of Chekhov’s short stories and Norse histories priced just outside of mid-month whimsy — were perfectly kept books of all topics. This is fairly novel, as these kind of shops tend to have a bit of a jumble sale approach to quality. There were boxes of books earmarked for charity shops that had not made the standard. I’m a terrible hoarder, with a bad habit for picking up books I will have no time to read, but the allure of excellent covers is always too great to resist. Some people are suckers for classic Penguin cover designs, and they’re right to be, but I have a huge soft-spot for Faber & Faber. Very under-rated, and wilfully modernist a lot of the time, they are stark and beautiful. I picked up a couple of paperback editions of Beckett plays (editions I haven’t got already), and ended up in the poetry section. 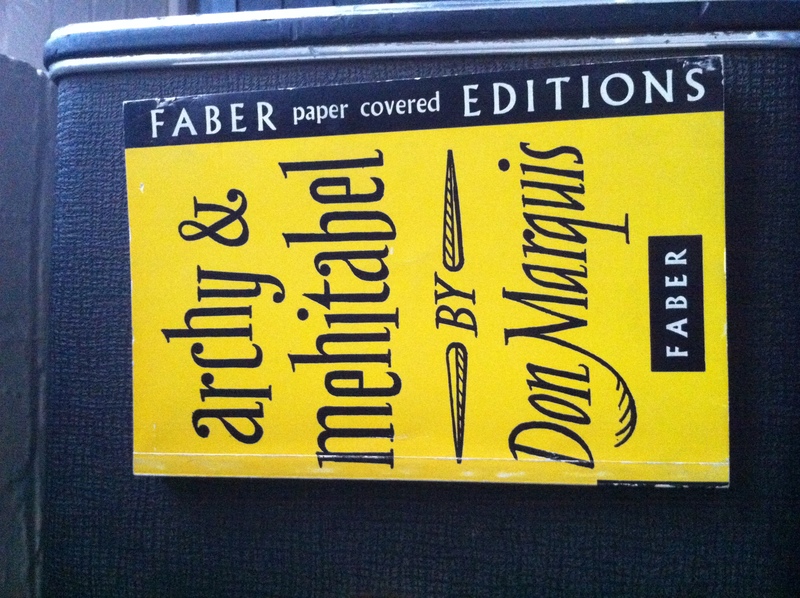 Scanning the spines, I pulled out a brilliant yellow book collecting poems by Don Marquis, called archy and mehitabel. I’ve never heard of Don Marquis, but I opened it up and it reminded me of two favourite things: ee cummings and George Herriman’s Krazy Kat & Ignatz. Like Krazy Kat, archy & mehitabel features a cast of animals — the text is written ‘by’ a cockroach called archy, and featuring a lot of animals that have previously been humans: mehitabel, the cat; warty bliggens, the toad; freddy, the rat. There’s a depth to the words and use of language that raises it above a pretend naïvety; the use of animal characters is to offer the ability to indulge a different perspective and gently poke fun at the human world from a differently privileged position. Which makes me very happy, and reminds me of the wonderful purpose of physical bookshops, particularly second-hand ones: accidental discovery, judging books by their covers and trusting your own hunches. Love live indie. One day they’ll pass, and we’ll say “wotthehell wotthehell”.